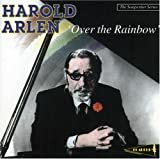 Harold Arlen was a musical prodigy who left school to work as a singer, pianist, arranger, composer and who, by his teens, had formed a jazz trio. He had his first Broadway hit, “Get Happy” (1930), with Ted Koehler. They went on to write for Cotton Club revues and film, turning out “Between the Devil and the Deep Blue Sea” (1931), “I Got A Right To Sing the Blues” (1932), “Stormy Weather” (1933), and “Let’s Fall in Love” and “Ill Wind” (1934). Arlen wrote “Last Night When We Were Young” (1935) with “Yip” Harburg, the tip of their iceberg, so to speak, because in 1939 they scored The Wizard of Oz. “Over the Rainbow” won the Oscar and became Judy Garland’s signature tune. But Arlen’s talent for creating complex melodic and rhythmic structures made other songs from the film popular with jazz musicians--“Ding-Dong! The Witch Is Dead” and “If I Only Had a Brain.” The pair’s “Happiness is Just a Thing Called Joe” from Cabin in the Sky was nominated for a 1942 Oscar. Arlen’s collaboration with Johnny Mercer turned out equally dazzling songs: “Blues in the Night” (1941), “That Old Black Magic” (1942), “My Shining Hour” (1943), “One For My Baby” (1943), “Ac-Cent-Tchu-Ate the Positive” (1944), “Out Of This World” (1945) and “Any Place I Hang My Hat Is Home” and “Come Rain or Come Shine” (1946). Arlen’s Blues Opera Suite was performed by Andre Kostelanetz at Carnegie Hall in 1957, and he continued to work until his wife’s death in 1970 when he withdrew from public life.